As I mentioned in an earlier post, I recently took a trip upstate to indulge in the beauty of the Hudson Valley. The friend I visited works at Old Field Farm, where she raises heritage chickens that produce the most beautiful eggs I have ever seen. 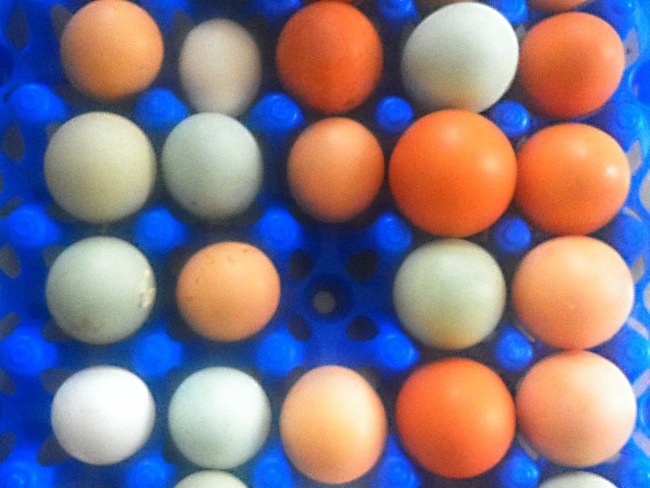 With pastel colored shells and bright orange yolks, these eggs deserve to be transformed into something delicious. 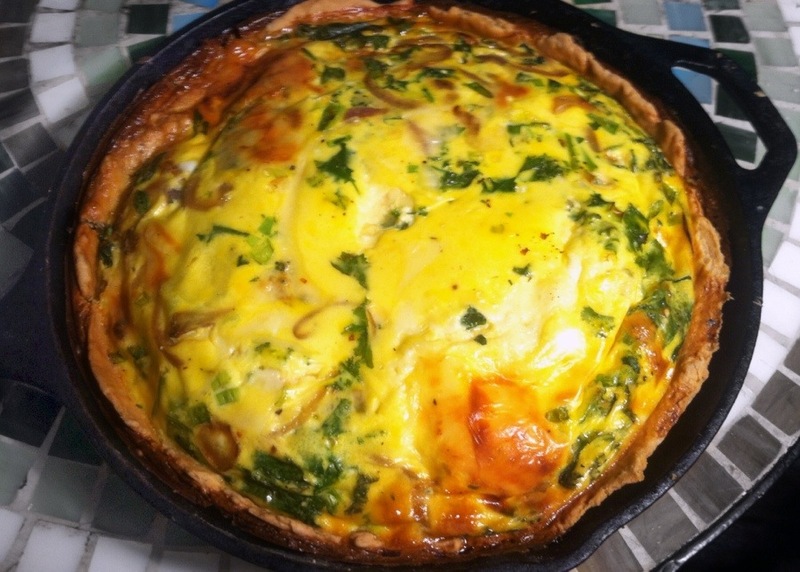 Here, I’ve made a quiche featuring the very last of the winter greens from my garden. Change up the combination of ingredients as you please, but make sure to use good quality eggs, since they are the star of the show. Also, you can simplify things by using a store bought pie crust if you’re not up to making your own. 2. Roll out the pie crust on a lightly floured surface and fit to a round, oven-proof 9″ pan. Chill in the refrigerator for 10 minutes then lightly prick the bottom a few times. Press a sheet of aluminum foil or parchment paper against the whole pastry, then fill the with pie weights. If you don’t have pie weights, dried beans or uncooked rice will suffice. Omit this step if you’re using a store bought crust and preheat the oven to 375 instead of 425. 3. While the crust is baking, heat a teaspoon of olive oil over medium heat and sauté the onions and garlic. When the onions are soft, stir in the greens and cook til just wilted. Remove from heat and let cool. 4. Lightly whisk together the eggs, milk, salt and pepper, then stir in vegetables and cheese. Pour the egg mixture into the pie crust. 5. Bake for 35 to 45 minutes until the egg mixture is set. Cut into wedges and serve.